Dosage recommendations for adult patients with renal impairment are provided in Table 1 [see Use in Specific Populations ( 8.6), Clinical Pharmacology ( 12.3) ] . Famciclovir is contraindicated in patients with known hypersensitivity to the product, its components, or Denavir ® (penciclovir cream). Cases of acute renal failure have been reported in patients with underlying renal disease who have received inappropriately high doses of famciclovir for their level of renal function. Dosage reduction is recommended when administering famciclovir to patients with renal impairment [see Dosage and Administration ( 2.3), Use in Specific Populations ( 8.6) ] . Acute renal failure is discussed in greater detail in other sections of the label [see Warnings and Precautions ( 5) ] . • Patients may have entered into more than one clinical trial. • Percentage of patients with laboratory abnormalities that were increased or decreased from baseline and were outside of specified ranges. • n values represent the minimum number of patients assessed for each laboratory parameter. There are no data on the presence of famciclovir (prodrug) or penciclovir (active drug) in human milk, the effects on the breastfed infant, or the effects on milk production. Animal data indicate that penciclovir is present in the milk of lactating rats (see Data). The developmental and health benefits of breastfeeding should be considered along with the motherâ€™s clinical need for famciclovir and any potential adverse effects on the breastfed infant from famciclovir or from the underlying maternal condition. Decreased fertility, due to testicular toxicity, was observed in male animals following repeated administration of famciclovir or penciclovir [see Nonclinical Toxicology ( 13.1)] . The efficacy of famciclovir has not been established in pediatric patients. The pharmacokinetic profile and safety of famciclovir (experimental granules mixed with OraSweet ® or tablets) were studied in 3 open-label studies. Study 1 was a single-dose pharmacokinetic and safety study in infants 1 month to less than 1 year of age who had an active herpes simplex virus (HSV) infection or who were at risk for HSV infection. Eighteen subjects were enrolled and received a single dose of famciclovir experimental granules mixed with OraSweet based on the patientâ€™s body weight (doses ranged from 25 mg to 175 mg). These doses were selected to provide penciclovir systemic exposures similar to the penciclovir systemic exposures observed in adults after administration of 500 mg famciclovir. The efficacy and safety of famciclovir have not been established as suppressive therapy in infants following neonatal HSV infections. In addition, the efficacy cannot be extrapolated from adults to infants because there is no similar disease in adults. Therefore, famciclovir is not recommended in infants. In a phase 3 trial in adults in which patients received a single 1500 mg dose of famciclovir or placebo, the median time to healing among patients with non-aborted lesions was 4.4 days in the famciclovir 1500 mg single-dose group and 6.2 days in the placebo group. Of note, in the adult study treatment was initiated by patients within 1 hour after the onset of symptoms [see Clinical Studies ( 14.1) ]. Based on the efficacy results in Study 3, famciclovir is not recommended in children 12 to less than 18 years of age with recurrent herpes labialis. No famciclovir dosage adjustment based on age is recommended unless renal function is impaired [see Dosage and Administration ( 2.3), Clinical Pharmacology ( 12.3) ]. In general, appropriate caution should be exercised in the administration and monitoring of famciclovir in elderly patients reflecting the greater frequency of decreased renal function and concomitant use of other drugs. • CL CR is measured creatinine clearance. • CL/F consists of bioavailability factor and famciclovir to penciclovir conversion factor. A dosage adjustment is recommended for patients with renal impairment [see Dosage and Administration ( 2.3) ] . Mild or moderate hepatic impairment (chronic hepatitis [n=6], chronic ethanol abuse [n=8], or primary biliary cirrhosis [n=1]) had no effect on the extent of availability (AUC) of penciclovir following a single dose of 500 mg famciclovir. However, there was a 44% decrease in penciclovir mean maximum plasma concentration (C max) and the time to maximum plasma concentration (t max) was increased by 0.75 hours in patients with hepatic impairment compared to normal volunteers. No dosage adjustment is recommended for patients with mild or moderate hepatic impairment. The pharmacokinetics of penciclovir has not been evaluated in patients with severe hepatic impairment. Conversion of famciclovir to the active metabolite penciclovir may be impaired in these patients resulting in a lower penciclovir plasma concentrations, and thus possibly a decrease of efficacy of famciclovir [see Clinical Pharmacology ( 12) ]. In a randomized, double-blind, placebo-controlled trial conducted in 304 immunocompetent black and African American adults with recurrent genital herpes there was no difference in median time to healing between patients receiving famciclovir or placebo. In general, the adverse reaction profile was similar to that observed in other famciclovir clinical trials for adult patients [see Adverse Reactions ( 6.1) ]. The relevance of these study results to other indications in black and African American patients is unknown [see Clinical Studies ( 14.2) ]. 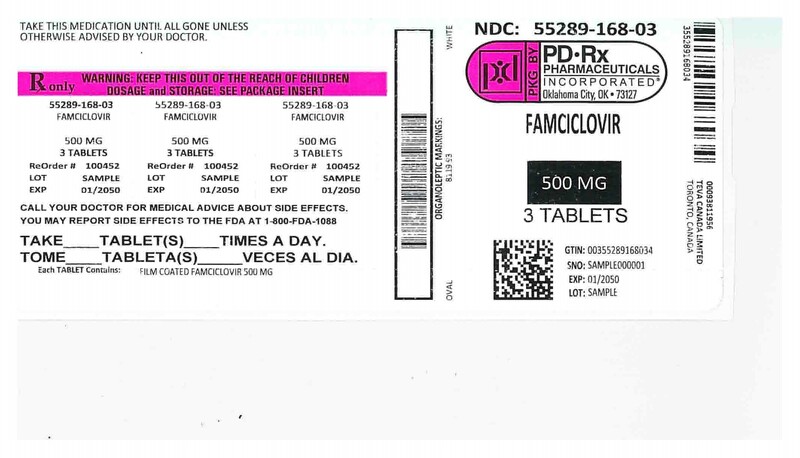 Famciclovir is an orally administered prodrug of the anti-alpha herpes viral agent penciclovir [see Microbiology ( 12.4) ] . 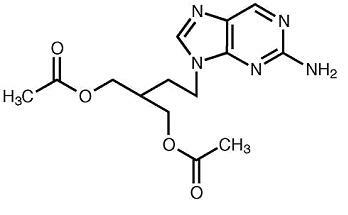 Famciclovir is the diacetyl 6-deoxy analog of the active antiviral compound penciclovir. Following oral administration famciclovir undergoes rapid and extensive metabolism to penciclovir and little or no famciclovir is detected in plasma or urine. Penciclovir is predominantly eliminated unchanged by the kidney. Therefore, the dose of famciclovir needs to be adjusted in patients with different degrees of renal impairment [see Dosage and Administration ( 2.3) ]. • Based on pharmacokinetic data from 17 studies. • AUC (0-inf) (mcg hr/mL) = area under the plasma concentration-time profile extrapolated to infinity. • C max (mcg/mL) = maximum observed plasma concentration. • t max (h) = time to C max. Following oral single-dose administration of 500 mg famciclovir to 7 patients with herpes zoster, the AUC (mean ± SD), C max, and t max were 12.1±1.7 mcg hr/mL, 4.0±0.7 mcg/mL, and 0.7±0.2 hours, respectively. The AUC of penciclovir was approximately 35% greater in patients with herpes zoster as compared to healthy volunteers. Some of this difference may be due to differences in renal function between the 2 groups. Penciclovir C max decreased approximately 50% and t max was delayed by 1.5 hours when a capsule formulation of famciclovir was administered with food (nutritional content was approximately 910 Kcal and 26% fat). There was no effect on the extent of availability (AUC) of penciclovir. There was an 18% decrease in C max and a delay in t max of about 1 hour when famciclovir was given 2 hours after a meal as compared to its administration 2 hours before a meal. Because there was no effect on the extent of systemic availability of penciclovir, famciclovir can be taken without regard to meals. Metabolism: Following oral administration, famciclovir is deacetylated and oxidized to form penciclovir. Metabolites that are inactive include 6-deoxy penciclovir, monoacetylated penciclovir, and 6-deoxy monoacetylated penciclovir (5%, less than 0.5% and less than 0.5% of the dose in the urine, respectively). Little or no famciclovir is detected in plasma or urine. An in vitro study using human liver microsomes demonstrated that cytochrome P450 does not play an important role in famciclovir metabolism. The conversion of 6-deoxy penciclovir to penciclovir is catalyzed by aldehyde oxidase. Cimetidine and promethazine, in vitro inhibitors of aldehyde oxidase, did not show relevant effects on the formation of penciclovir in vivo [see Drug Interactions ( 7.2) ]. Geriatric patients: Based on cross study comparison, penciclovir AUC was 40% higher and penciclovir renal clearance was 22% lower in elderly subjects (n=18, age 65 to 79 years) as compared with younger subjects. Some of this difference may be due to differences in renal function between the 2 groups. No famciclovir dosage adjustment based on age is recommended unless renal function is impaired [see Dosage and Administration ( 2.3), Use in Specific Populations ( 8.5) ] . Patients with renal impairment: In subjects with varying degrees of renal impairment, apparent plasma clearance, renal clearance, and the plasma-elimination rate constant of penciclovir decreased linearly with reductions in renal function, after both single and repeated dosing [see Use in Specific Populations ( 8.6) ] . A dosage adjustment is recommended for patients with renal impairment [see Dosage and Administration ( 2.3) ]. Patients with hepatic impairment: Mild or moderate hepatic impairment had no effect on the extent of availability (AUC) of penciclovir [see Use in Specific Populations ( 8.7) ]. No dosage adjustment is recommended for patients with mild or moderate hepatic impairment. The effect of severe hepatic impairment on the pharmacokinetics of penciclovir has not been evaluated. Mechanism of action: Famciclovir is a prodrug of penciclovir, which has demonstrated inhibitory activity against herpes simplex virus types 1 (HSV-1) and 2 (HSV-2) and varicella zoster virus (VZV). In cells infected with HSV-1, HSV-2 or VZV, the viral thymidine kinase phosphorylates penciclovir to a monophosphate form that, in turn, is converted by cellular kinases to the active form penciclovir triphosphate. Biochemical studies demonstrate that penciclovir triphosphate inhibits HSV-2 DNA polymerase competitively with deoxyguanosine triphosphate. Consequently, Î±-herpes viral DNA synthesis and, therefore, replication are selectively inhibited. Penciclovir triphosphate has an intracellular half-life of 10 hours in HSV-1-, 20 hours in HSV-2- and 7 hours in VZV-infected cells grown in culture. However, the clinical significance of the intracellular half-life is unknown. Antiviral activity: In cell culture studies, penciclovir has antiviral activity against the following herpes viruses: HSV-1, HSV-2 and VZV. The antiviral activity of penciclovir against wild type strains grown on human foreskin fibroblasts was assessed with a plaque reduction assay and staining with crystal violet 3 days post-infection for HSV and 10 days postinfection for VZV. The median EC 50 values of penciclovir against laboratory and clinical isolates of HSV-1, HSV-2, and VZV were 2 Î¼M (range 1.2 to 2.4 Î¼M, n=7), 2.6 Î¼M (range 1.6 to 11 Î¼M, n=6), and 34 Î¼M (range 6.7 to 71 Î¼M, n=6), respectively. Penciclovir-resistant HSV-1 and HSV-2 strains were isolated in cell culture. Penciclovir-resistant mutants of HSV and VZV resulted from mutations in the viral thymidine kinase (TK) and DNA polymerase (POL) genes. Frameshifts were commonly isolated and result in premature truncation of the HSV TK product with decreased enzymatic activity and consequent decreased susceptibility to penciclovir. Mutations in the viral TK gene may lead to complete loss of TK activity (TK negative), reduced levels of TK activity (TK partial), or alteration in the ability of viral TK to phosphorylate the drug without an equivalent loss in the ability to phosphorylate thymidine (TK altered). In cell culture, the following resistance-associated substitutions in TK of HSV-1 and HSV-2 were observed: HSV-1 TK G6C, F13L, H142Y, G200D, L205S, S254Stop, V267G, and T287M; HSV-2 TK G39E, F191L, E226K, and T288M. The median EC50 values observed in a plaque reduction assay with penciclovir resistant HSV-1, HSV-2, and VZV were 69 Î¼M (range 14 to 115 Î¼M, n=6), 46 Î¼M (range 4 to > 395 Î¼M, n=9), and 92 Î¼M (range 51 to 148 Î¼M, n=4), respectively. Clinical HSV-1 and HSV-2 isolates obtained from patients who failed treatment with acyclovir for their Î±-herpesvirus infections were evaluated for genotypic changes in the TK and POL genes. These HSV isolates had frameshift mutations leading to loss of thymidine kinase or had substitutions in the viral thymidine kinase and viral DNA polymerase. Mutagenesis: Famciclovir and penciclovir (the active metabolite of famciclovir) were tested for genotoxic potential in a battery of in vitro and in vivo assays. Famciclovir and penciclovir were negative in in vitro tests for gene mutations in bacteria ( S. typhimurium and E. coli) and unscheduled DNA synthesis in mammalian HeLa 83 cells (at doses up to 10,000 and 5,000 mcg/plate, respectively). Famciclovir was also negative in the L5178Y mouse lymphoma assay (5000 mcg/mL), the in vivo mouse micronucleus test (4800 mg/kg), and rat dominant lethal study (5000 mg/kg). Famciclovir induced increases in polyploidy in human lymphocytes in vitro in the absence of chromosomal damage (1200 mcg/mL). Penciclovir was positive in the L5178Y mouse lymphoma assay for gene mutation/chromosomal aberrations, with and without metabolic activation (1000 mcg/mL). In human lymphocytes, penciclovir caused chromosomal aberrations in the absence of metabolic activation (250 mcg/mL). Penciclovir caused an increased incidence of micronuclei in mouse bone marrow in vivo when administered intravenously at doses highly toxic to bone marrow (500 mg/kg), but not when administered orally. • Based on patient reported data; not necessarily confirmed by a physician. • Patients recurrence-free at time of last contact prior to withdrawal. A randomized, double-blind trial compared famciclovir 500 mg twice daily for 7 days (n=150) with oral acyclovir 400 mg 5 times daily for 7 days (n=143) in HIV-infected patients with recurrent orolabial or genital herpes treated within 48 hours of lesion onset. Approximately 40% of patients had a CD 4+ count below 200 cells/mm 3, 54% of patients had anogenital lesions and 35% had orolabial lesions. Famciclovir therapy was comparable to oral acyclovir in reducing new lesion formation and in time to complete healing. 500 mg â€“ White, capsule-shaped, film-coated, unscored tablets, debossed with â€œ8119â€ on one side and â€œ93â€ on the other side. Available in bottles of 3 (NDC 55289-168-03). Do not take famciclovir tablets if you are allergic to any of its ingredients or to Denavir ® (penciclovir cream). See the end of this Patient Information leaflet for a complete list of ingredients in famciclovir tablets.